Quizzes are a great tool for adding much needed interaction during long presentations or testing learners that they have actually understood a topic. I’ve seen quizzes and interactive voting applied in lessons and conferences and when done correctly, this can really engage your audience. The following a list of online software I have used previously but by no means is a comprehensive list of all quiz software that is out there. I have focused on Free and Freeium HTML5 platforms that will let you create online quizzes without charging you a penny. Kahoots lets you create fun learning games in minutes – its clean interface and well layed out design lends itself to well to mobile devices. Once you have created your interactive quiz, a link can be generated and sent out to students to invite them to play. In my opinion the best use case for Kahoot is to be played live in a classroom whilst covering a presentation. You could use it at the start of a topic to check existing learners knowledge on a subject and stimulate conversation or at the end of section to confirm its sunk it. Either way, its fun and friendly design is suitable for all ages and designing the quiz is very straight forward. One thing to note maybe if you are divided your group into teams only one student would do the actual selection or inputting and the scores are calculated on how answered first been the contestants. In a few minutes, you can create a learning game for all ages, any topic. Kahoot! is even played in gym classes! Kahoot! works on any device with an internet connection. For players, no account or login is required to join a game. Kahoots are best played in a group setting, like a classroom. Players answer the questions on their own devices, while games are displayed on a shared screen to unite the lesson. It creates a ‘campfire moment’ encouraging players to look up and celebrate together. Besides creating your own kahoots, you can search among millions of existing games. Starting a conversation or reinforcing knowledge, introducing new topics or encouraging teamwork, and more – there’s so many different ways to Kahoot! 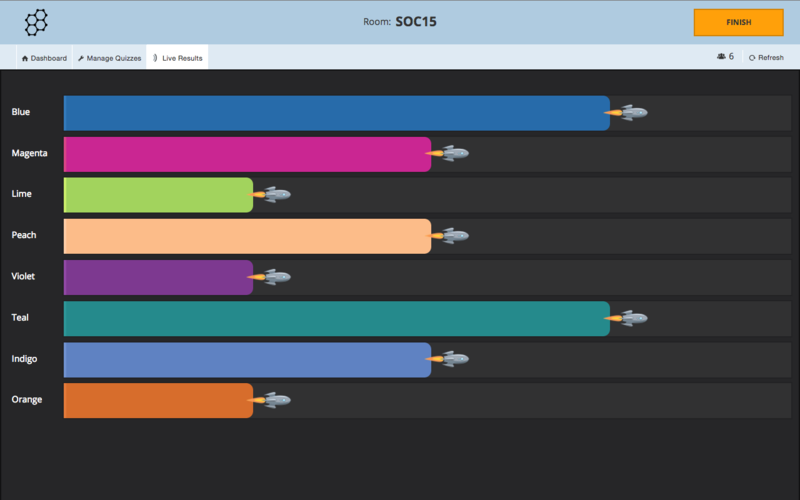 Socrative feels a bit more formal, but is still easy enough to build quizzes without a steep learning curve. You can quickly assess students with prepared activities or on-the-fly questions to get immediate insight into student understanding. Then use auto-populated results to determine the best instructional approach to most effectively drive learning. Visualize student performance relative to the core with the traffic light approach of red, yellow, and green mastery status. Flip the classroom! Create playlists for students of pinned resources. Align materials and resources in your curriculum maps and share the maps with your team. Poll your students with Multiple Choice, True False, or Short answer questions. Zero preparation is required. Find amazing quizzes made by other teachers, or create your own quizzes and share them with the world! Students play together, but each at their own pace. Gamfication elements like avatars, leaderboard and funny memes add to the fun! Review your work in the end. Start a “Live” game in class, or assign Quizizz as a fun “Homework” task. You control the competition by toggling the leaderboard, timer and other settings. Avatars, leaderboards, themes, music and memes! We’re always working on new ways to keep things interesting! Quizizz works on any device with a browser. It also has an awesome iOS, Android and Chrome apps. Make your audience feel more involved and motivated by enabling them to contribute to your presentations. Mentimeter shows the results live while your participants are voting with the web based mobile polling app directly in their browser, making sure everyone is part of the presentation. The most popular question type lets the audience choose one or more options that you provide – it’s both easy and effective. Visualize your questions and let your audience vote on images to interact in a new way. Let the audience rate statements on a scale; a quick way of getting useful data and analysis of trends and progress. The Open Ended question-type lets the audience freely type in their answer and is perfect for capturing questions during your presentation. If Scales are not enough, you can let the audience rate items in two dimensions to decide on complex matters.